To query patents using an unnormalized current assignee, use the ANRE_CUR field code. Assignee names in the standard keyword search fields in AcclaimIP are normalized. There are often hundreds of name variations for a single assignee, and it would be virtually impossible to work with assignee information without normalization. However, from time to time, you may want to search the unnormalized current assignee name. Keep in mind that the current assignee comes from the Assignment Database (sometimes called the Reassignment Database). 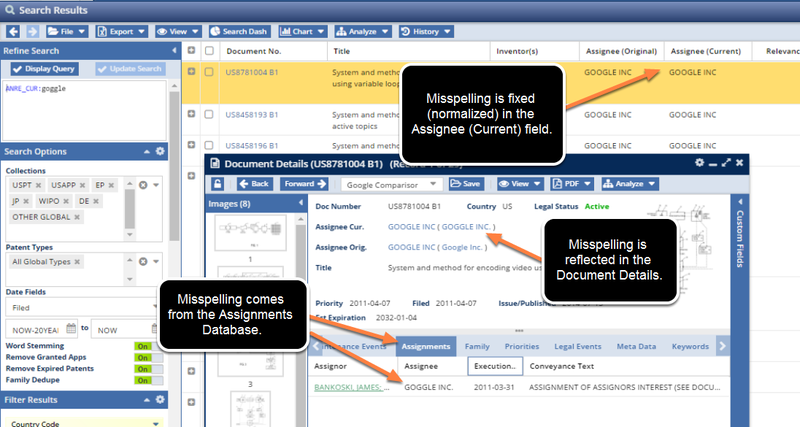 In the figure above, notice how there was a misspelling in the USPTO's Assignment Database. AcclaimIP draws from this information, which is why there is this misspelling listed in the information. We then go in and normalize the different variations. However, the original misspelling is left in the data fields. ANRE_CUR:goggle --> Searches for the misspelling of Google as Goggle.